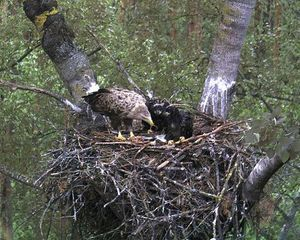 The camera was installed already in February but technical conditions are difficult in the area and the system could be adjusted only now at the ringing of the eaglets. The eaglets in this nest are a little later in than average but so we will be able to see them longer in the web camera. The female is named for the great Luban lake on the shore of which the nest is located. She has no rings, so her origins are not known but she may also be from Estonia. The male was hatched in north-eastern Lithuania near the Sartai lake in 2007 (his year ring is V506) and so he was named Sartas.